With a typical price of Â£3.99 for a 125g pack you expect more than just a brick of bloodworms or shrimps â€” and what you get from C.E. doesnâ€™t disappoint, reports Nathan Hill. The core range seems Discus oriented, with colour-enhanced beefheart, but other products are dedicated elsewhere, with Malawi diets for herbivore, omnivore or piscivore, community tank foods (including a tailoring option) and even plec herbivore or plec carnivore. When it defrosts it has an almost ‘sausage meat’ texture. This is not just a mixture of ingredients like fish, Daphnia and worms all tossed together and frozen but a prepared blend that’s more putty-like. Many ingredients can’t be visually identified, though a good, close sniff will reveal them. The community mix is taken up readily by my own fish — tetra, pencilfish, cichlids, gobies, minnows, gouramis, and other usual suspects — and nothing is rejected. In fact, my fish go crazy every time I offer it. Unlike other foods I’ve used this stuff sinks like an anvil and only once the fish start tearing it apart does it float about. If you have plenty of surface and mid-water species you might want to crumble it beforehand. Steve Hancocks used C .E. Predator food with his Ctenolucius hujeta, and reports: “The food came securely wrapped in a poly-box with ice packs and was virtually still frozen. "The slab is quite thick, there’s plenty of it too so I use pliers to snap off a suitable amount. Thawed it’s like a paste, the consistency of sausage meat, and a little sticky. "You can see it’s made of various ingredients and it smells fine. "My fish have outgrown bloodworm and were refusing cockle and fresh prawn. I roll pea-sized balls, which lose the sticky consistency, and they take it with no fuss. They ‘strike’ very quickly, so I make sure they’re not spitting it out after tasting it. "There’s no problem with that and they all come back for more. "I’ve been feeding C. E. Predator along with lancefish ever since with no issues. There’s no clouding of water either. "I’ve even been testing it on a Raphael catfish in another tank and he loves it. 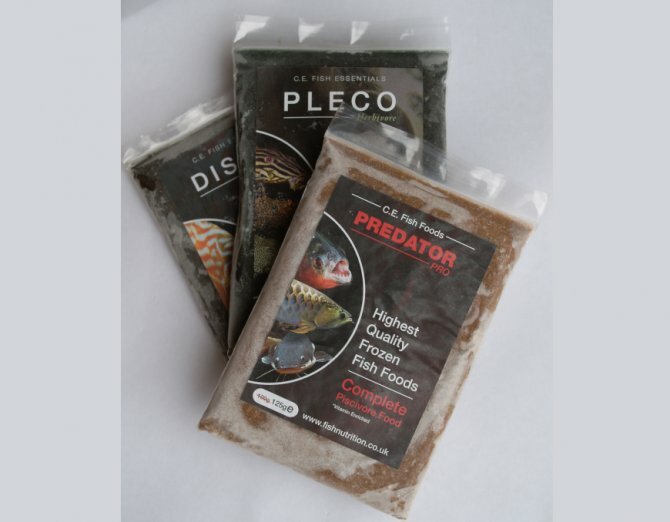 This Predator food is working very well for me." Kevin Webb has been playing with Malawi omnivore with his African fish and reports: “My Tanganyikans love the stuff. I’m not 100% on the packaging though as I prefer the blister type of pack. "I have to use a knife to cut pieces to defrost prior to feeding and the packaging gets damaged, spoiling the resealing aspect. "Imagination or not, my fishes’ colours seem more vibrant. I’d â€¨buy more at the price as it’s good value." Mats Petersson used some Greenheart colour enhancer on his Geophagus and says: “My immediate response is that the food is liked. I can’t say I notice much change in ‘how green’ the fish are, but you can clearly see a blue-green sheen to the water used to defrost the food. The fish are pretty green already, so it may be hard to tell how much greener â€¨they get." Janet Cremetti took on the Redheart colour enhancer, and tells us: “I wasn’t available when the delivery arrived so it was evening before I opened the box. Given the time out of a freezer the insulated packing and cool pack performed well, and although there was minor softening on the edges the food was by no means thawed. "My initial impression of packaging is good. I particularly like the zip-lock style resealable pouches and colourful labels. "However, the product is so tightly packed and sticks to the pouch that it’s impossible to open without tearing, so defeating the ability to reseal. I need to wrap the pack in cling film when returning it to the freezer. "This is a sizeable block of food with no obvious smell and a similar colour to frozen bloodworm. The instructions suggest snapping off a suitably-sized piece and thawing in tank water. Unfortunately, I have to resort to using a sharp knife to score it all round before I can break any off. "This is a little dangerous as the block tends to slide while I score it. Pre-scoring as in a chocolate bar would help. "After thawing the initial colour fades and the food is a paler, deep pink. It’s firm to the touch and still has no noticeable smell. "Once the food is in the water it breaks into small particles all over the tank, but the fish seem to enjoy it very much and rapidly learn to recognise it. They show keen responses, with Severums and Angelfish eagerly hand feeding. "I occasionally leave the food to thaw for half an hour or so and I find the thawing water has stained a very deep red and the food a paled anaemic pink. "This gives the impression that the colour enhancers have leached into the water, which makes me question how well the food would live up to bringing out the colour in my fish. "After using for a few days, I noticed an oily floating layer on the water surface and small floating debris in the water column. This appears to be small particles of food, blown around by the filter and too small to interest the fish. "This tank is the only one to show these problems, despite surface agitation remaining at the usual level throughout the test. "Personally, I can’t see any change in my Severum’s colour, but here are some photos for you to judge for yourself. I’ve used the same camera, lens and settings for both images. so any change should be down to the food." Overall it looks like a huge thumbs-up for C. E. foods, and aside some issues with carving it into portions, and damaging the resealable bags, our fish seem overjoyed to be eating it. I remain so taken by the soft, palatable texture, and I love how my smaller fish can take a bite from a larger block to suit their mouths. I’d recommend this food to anyone after quality ingredients. Prices: Most foods £3.99 for 125g, Community mix £3.49, Algae plus £5.99.